SOME SKATCHES FOR EXPO IN DRAVOGRAD! HERE ARE SOME DRAWINGS I MADE IN DRAWOGRAD FOR MY EXPO !SOME OF THEM I USE AND SOME OF THEM I DID,T! some cute creatures !left one was use for expo! this one i also use for my serius expo! AND THIS IS IT FOR NOW BOYS AND GIRLS! AS YOU KNOW WE GO ON TOUR AT 28OF AVGUST AND I HAD SOME SERIUS TRAININGS AT MY RAMP! HERE ARE SOME PHOTOS TAKEN BY SELFSHOOT! GATEKEPER OF BOWL IN POSTOJNA GET TATTOS! I HAVE 2 NEW TATTOS ON MY BODY! THANKS MIRIAM (CLICK) TO DRAW THOSE TWO GREAT DRAWINGS ON MY SKIN WITH MARKER !AND THANKS ONCE AGAIN TO BADINK TATTO MAKER BOLIČ (CLICK)TO MAD A TATTO! WE HAD A GREAT TIME AT SEA SIDE TO AND I WILL NEWER FORGET THOSE DAYS! SO NOW I AM PREPARING FOR R.O.W TOUR . SEE YOU I ONE MONTH! THE DIRECTOR SEND ME THIS BEAUTIFUL MMS ! MY FIRST GRAFIC FOR T-SHIRT BECOME REAL! 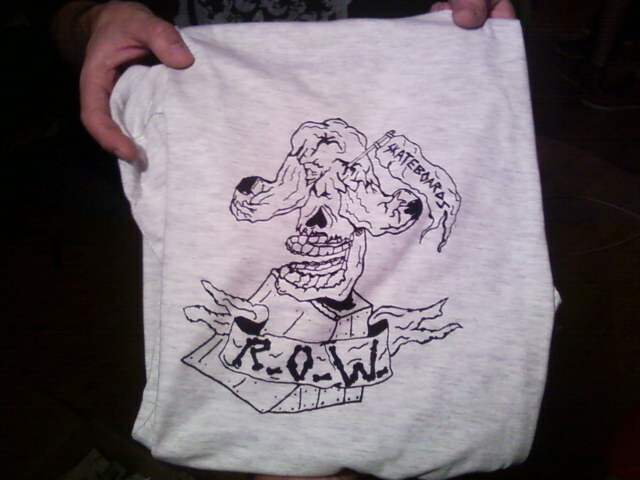 AND GRAFIC ON THE SHIRT! AND IT LOKS LIKE THIS ON THE BODY ! SHIRTS ARE NOW AVAILIBLE AT R.O.W(CLICK) IF SOMEBODY WOULD LIKE TO ORDER IT CLICK ON THE LINK! THE T-SHIRTS WILL BE AVAILIBLE IN DIFFERENT COLURS! (WHITE ,YELLOW,RED,GREY) SO IF YOU WANT SOME CONTACT US.! HERE ARE SOME GRAFIC I MADE IN GRAFIC COLONY IN PIVKA ! 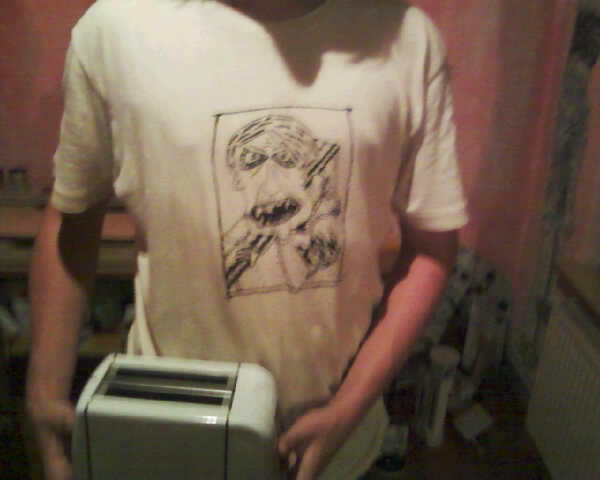 ACTUALY MY FIRST GRAFIC IN WOODCUT TEHNIC AND MY FIRST GRAFIC IN DRY POINT TEHNIC! 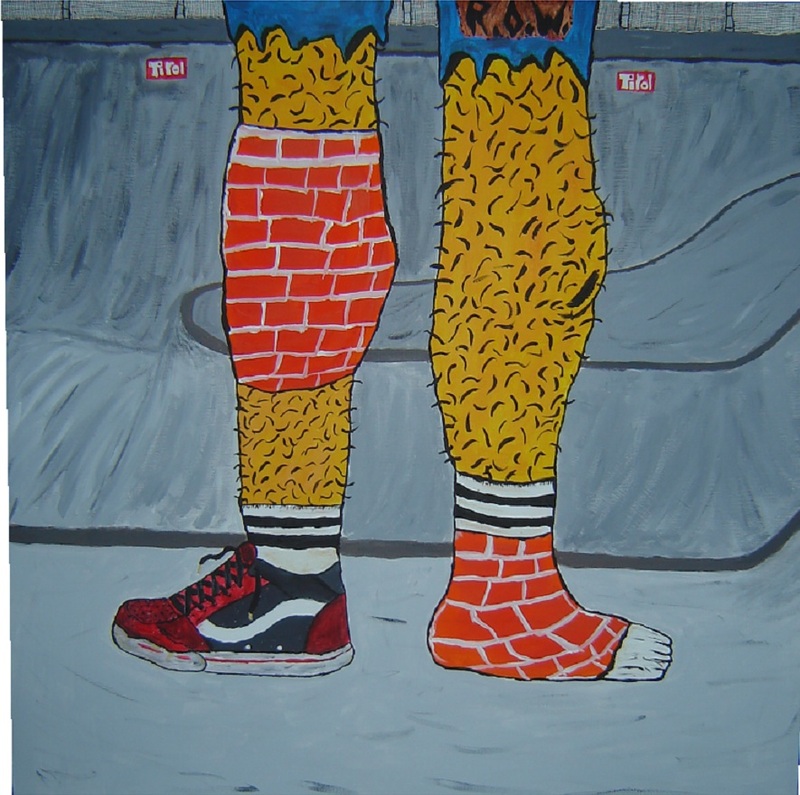 WHY I PAINT THIS PICTURE- BECOUSE THIS PARK DESTROY MY AND FRIENDS LEG FIRST DAY OF TOUR IN AUSTRIA, WE COULDNT SKATE FOR THE REST OF THE DAYS, ON TOUR!SO I DID THE BRICKS AROUND MY KNEE AND MY FRIENDS KLEMEN ANKLE! HHEHEH A MEMORY FOR ME AND MY FREND! KUTIČK FAMILY IS GETING BIGER! HERE IT IS A NEW KUTIČ RIDER !LITTLE CAT STILL WITH NO NAME! AND ON FIRST PICTURE IS HER MUM! HER MOTHER DIG A HOLE FOR HER LITTLE CATY! HOPE IT WILL BE STRONG AND HEALTY TO WATCH MY MINI RAMP! MOTHER WATCHING FOR HER CHILD! IT JUST OPENED THE EYES! MY FIRST GRAFIC FOR STICKER! 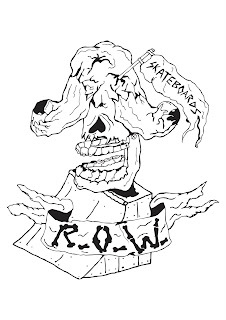 this is the grafic i made for R.O.W. 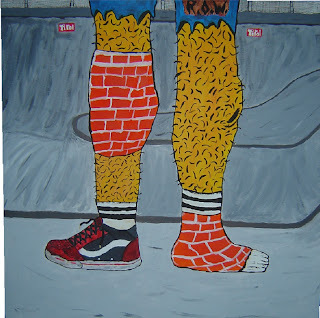 SKATEBOARDS! 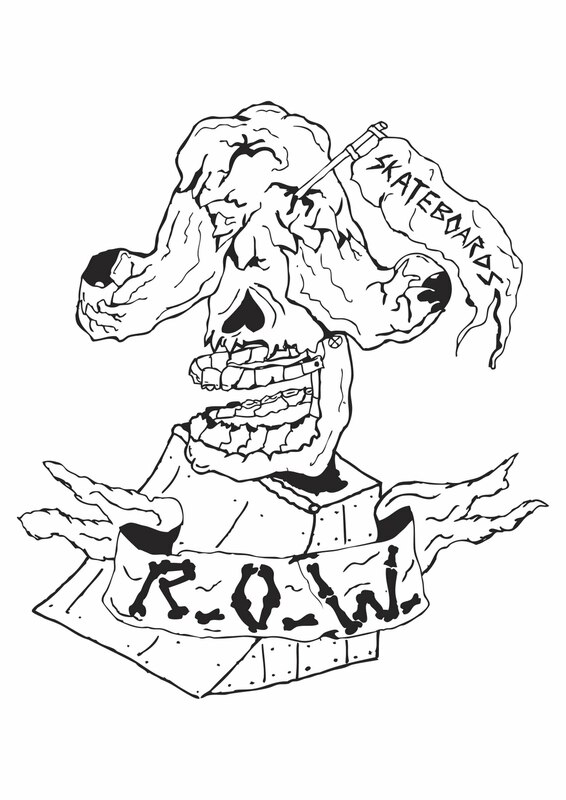 we use this grafic for stickers !this is my first grafic been used for r.o.w.! thanks everybody for support us! and stickers availible in white and yelow color! ALL THE STICERS WHERE DID WITH SILSCREN! EVERY RAMP HAS HIS OWN PRINC ! NEW DRAWING PRINC OF THE RAMP! ACRYL WITH LOTS OF WATHER MIX AND BLACK AND BLUE PENCIL! BUILD YOUR OWN RAPS AND ONE DAY YOU WILL BECOME A PRINC OF YOUR RAMP! HERE ARE SOME PHOTOS FROM LAST WEEK EXPO I HAD IN DRAVOGRAD! WE HAD GREAT TIME !SKATE EVERY DAY ,FILMING,HANGING,DRINKING LOT,S OF BEER AND TALK STUPID JOKES! SESSION IN LIVINGROOM ALSO ! AND THEN PARTY ALL NIGHT! 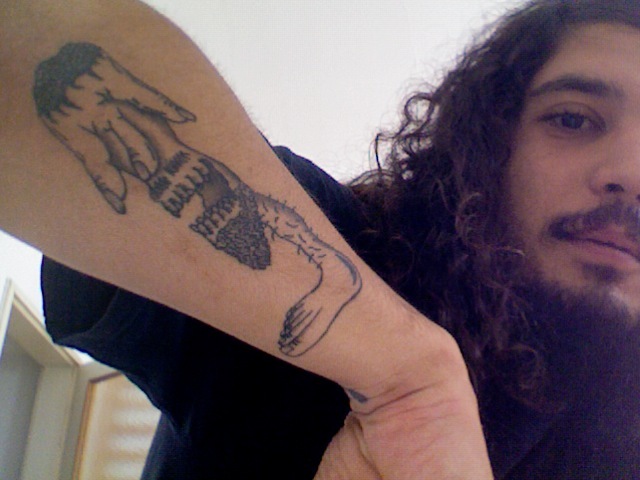 HERE IS A PICTURE FERIT BATIR(CLICK) SEND TO ME OF HIS TATTO ! 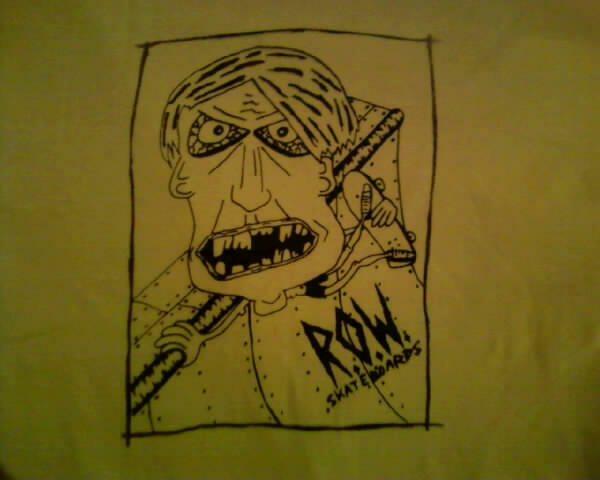 THE DRAWING WAS MADE BY ME AND PERSONAL R.O.W. GANG TATTO MAKER MIČO CLICKTATTOED THIS BEAUTIFUL TATTO ON HIS HAND ! THANKS FERIT FOR PHOTO AND FOR SPACE ON HIS HAND AND MIČO TO DO THAT GREAT JOB!